Here is a video of a typical 4 week old litter-I love this age! This is another of my show cats-Scarlet (QGC CajunRagdolls Scarlet O Hara). She is an excellent example of a blue bicolor and recently became a Quadruple Grand Champion! 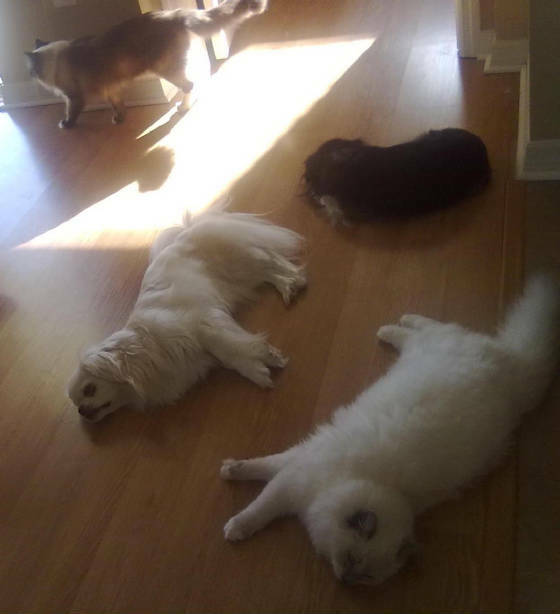 Proof that cats and dogs can get along-as long as the cats are Ragdolls! 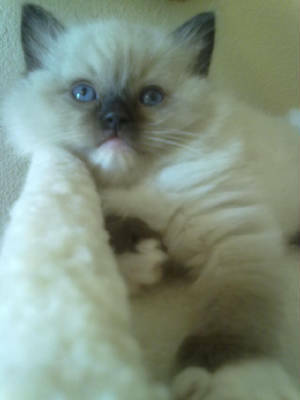 Breeder of Pet, Show, and Breeding Quality Ragdoll Cats and Kittens in Tampa, Florida. I breed the traditional blue and seal colors in all three patterns-mitted, bicolor, and colorpoint. Kittens available, occasionally adults available. Champion lines. 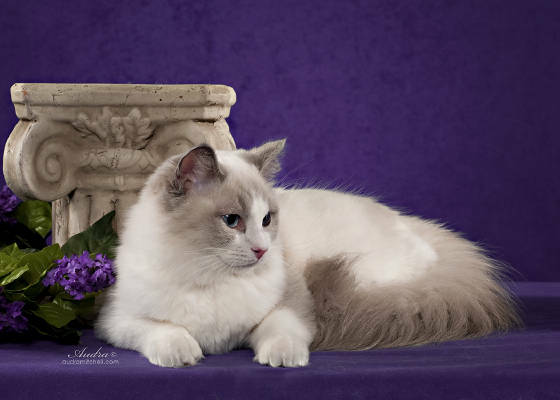 I am a TICA registered cattery and member of RFCI (Ragdoll Fanciers Club International), RFW (Ragdoll Fanciers Worldwide Club), and RI (Ragdoll International) and all kittens are registered with TICA and can be registered with CFA. All breeding cats have been tested clear of HCM as well as FIV/Felv. I am a closed cattery (and do not offer stud service) for the health of the cats/kittens. People are generally first attracted to Ragdolls because of their beautiful blue eyes and coloring and their soft silky coat. Once they get to know a Ragdoll they are impressed by their amazing personality. Ragdolls are extremely loving, laid back, floppy cats. They are often described as "dog-like" because of how devoted they are to their people. They are not your typical aloof housecats. They will follow you from room to room. They dislike being left alone and will meet you at the door when you come home. Ragdolls get along excellently with other pets. I personally raise mine with my two dogs. They all play together, sleep together, do every everything together. Ragdolls are also extremely friendly to strangers and very good with kids. They absolutely get along with everything and everyone! They get the name Ragdoll because when you hold them they just totally relax like a child's floppy rag-doll. This is great for children who might not always hold a kitten or cat perfectly. Ragdolls will put up with much more without scratching or biting than an ordinary cat will. Even people who aren't really "cat people" love Ragdolls because of their sweet laid back nature. More than any other breed of cat, Ragdolls really make a connection with their family.